We would like thank all the vendors for their participation in our conferences. We welcome our new vendors and are thankful for our many faithful vendors who have supported ACCFO for years. We would like to thank each and every vendor for their continued participation. 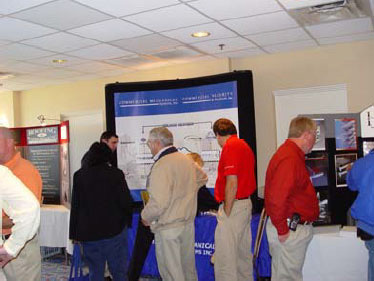 We strive to make the vendors feel part of our conference and include them in all of our activities. The vendors have the opportunity to visit with our members on a one-to-one basis and get a chance to show them their products and services. Some vendors create their own creative way of attracting ACCFO members. Vendors provide ACCFO members with literature, suggestions, technical knowledge, expert advice, product recommendations, sample of products, equipment recommendations, guidelines, proposals, and most of all their expertise and knowledge. Vendors understand that we have limited resources and they suggest ways for us to become more efficient in our operations and learn to do more with less. Learning new techniques and using new technology helps our community college facility personnel provide our students, faculty, staff, and community with a more efficient environment for learning. This is a great opportunity for ACCFO members to stay abreast of every changing products and services. Search for vendors by category.